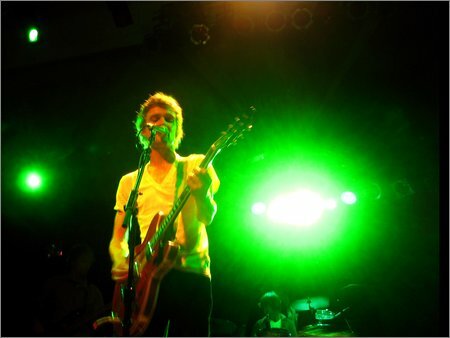 Brendan Benson, close up and unobscured. Photo by Lori. Last night Lori and I went to see Brendan Benson at the El Rey. He's a scrawny little guy. Looks very earnest, too, and to an extent he is, but his music has more than enough rocking guitar to make me happy. His backing band was a bunch of characters: The Surfer Bassist With Gray Hair, The Pale Detroit Rocker Guitarist, and The Drummer With Rhythmic Mouth Tics. We were almost right up against the stage for the whole show, where we were surrounded by die hard fans. They were all girls (OK, there was one guy), none of which broke 4'6". I'm not a short guy, but it seems like most rock shows have a higher proportion of tall motherfuckers in the crowd than you see in the general population, so I relished this one chance to not have to keep swaying from one side to another to see past some hipster's afro. If you can no longer spot the hipster with the afro, you're it. Noticed your blog, figured i'd say hi. We ate at zankow chicken once, and you beat me at bowling.